A coordinated effort to end homelessness — We know it’s not enough to just move people from place to place so I’ve brought together state, county and federal agencies to take action. New statewide efforts include expanded outreach services, shelter placement, and a homelessness coordinator and his team in the governor’s office. We’ve begun work on a new transitional shelter in Kaka‘ako and are exploring innovative approaches to provide help for those who are on the verge of being or are homeless. We’re happy to report that more and more people are stepping up to be part of the solution. Our first-ever Landlord Summit resulted in at least 80 O‘ahu landlords and property managers offering to rent to low-income and homeless people as part of a Housing First initiative. More available housing — Our people — especially our young people — need housing they can afford. 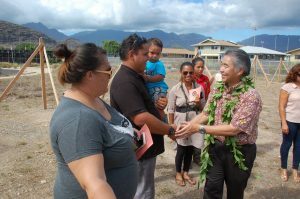 We have new members of the Hawai‘i Community Development Authority focused on creating more affordable housing to help alleviate shortages. With available state land near rail transit sites and public-private partnerships, we are building several hundred affordable rental units in high-demand areas of Honolulu. Mauna Kea and the Thirty-Meter Telescope — The recent Hawai‘i Supreme Court decision that invalidated the TMT permit provides direction to a new Land Board and more opportunity to discuss Mauna Kea’s future. I’ve already presented a 10-point plan (http://1.usa.gov/1cYdDKv) to take better care of the mountain. But we as a community need to find ways to protect our Native Hawaiian cultural legacy and the state’s natural resources while supporting scientific discovery and our economic future. The Hawaii Health Connector — We remain committed to helping people move from the private Connector site, which has struggled since its launch in 2013, to enrollment in the federal exchange at healthcare.gov. We also want to preserve the Prepaid Health Care Act that has kept our uninsured rate among the lowest in the nation. Top image: Gov. 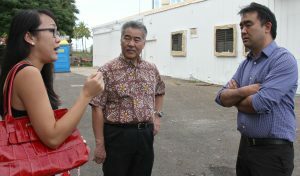 Ige and homelessness coordinator Scott Morishige tour the proposed Kaka‘ako shelter with HCDA acting asset manager Lindsey Doi. Bottom image: Under the Self-Help Housing Program, low-income families can help each other build their own homes, making these fee simple houses very affordable ($256,000 – $276,000).